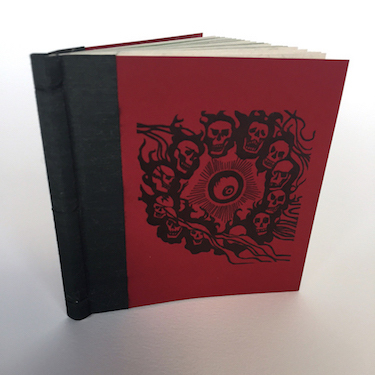 Conjure, if you will, the twang and deep throated rumble of a four-stringed biwa lute, accompanied by the tense voice of a blind storyteller who sits in the shadows. His song, the "Heike Monogatari," is ageless, having survived for thousands of years in the form of narrative poetry, although it has also found life in classic paintings, books, plays, films, and musical scores and is considered to be the greatest of the Japanese war stories. Mimi Nashi Hoiichi (or Hoiichi the Earless) is the story of a blind biwa player named Hoichi, whose ears are sheared off following a score of nights performing the "Heike Monogatari" song cycles in a cemetery off the shores of Shiminoseki, Yamaguchi-ken. 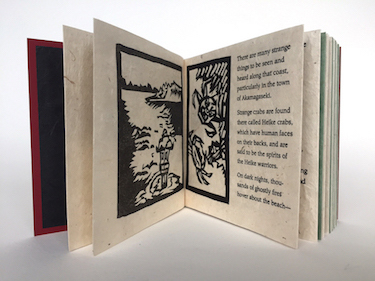 The story is a century old translation from a Japanese ghost story, written down in English and popularized by the American folklorist Lafcadio Hearn and illustrated by Patricia Wakida's original linocuts. 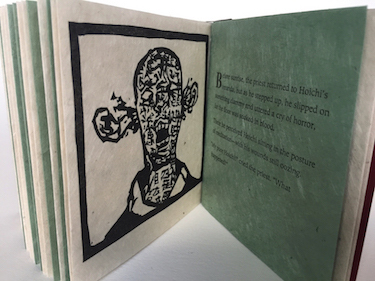 Patricia Wakida’s media of choice are linoleum blocks, wood and metal type, and hundred year old letterpresses. 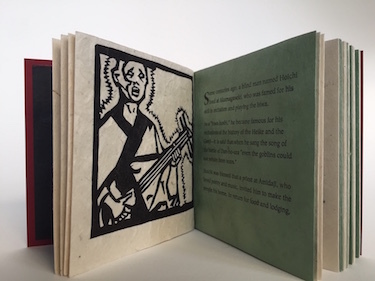 Most of her life has been dedicated to narratives: first as a reader and thinker; then as a Japanese papermaker, apprentice bookbinder, letterpress printer, and now a linoleum block carver. She is an active supporter and participant in California’s thriving literary and artistic worlds, having either organized, volunteered, or participated in exhibitions, panel discussions, and workshops that promote and nurture the creation and flourishing of artistic and literary expression.